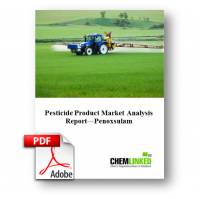 Penoxsulam is a post-emergence herbicide based on the acetolactate synthase (ALS) inhibitor. Penoxsulam was originally designed for use in rice fields and is capable of killing several pest grasses that prefer wet environments. These include barnyardgrass, young watergrass, Lolium ryegrasses, canarygrass species, annual blackgrass and wild buckwheat. It is useful for the removal of unwanted plants on golf courses, sports fields, and lawns. Penoxsulam was firstly launched in 2004 in USA, and enter China market by 2008.